The Christed Essene Masters will teach you how to unify your energetic field and bring your consciousness into unity. They will teach lightworkers how to embrace the flow of the new consciousness that is permeating our planet from the higher dimensions with grace and ease. They will also teach lightworkers how this new consciousness may be anchored and grounded through their pillars of light in service to humanity and Mother Gaia. 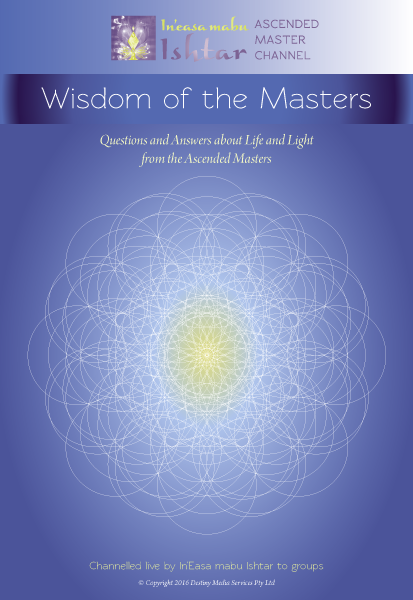 These Masters will offer the sacred teachings they shared with the Essenes more than 2000 year ago so that Lightworkers who incarnate on Earth in loving service to the divine light may learn to open their hearts to themselves and accept and embrace their unique gifts. The Christed Essene Masters will show you how to resolve all energy that creates separation within your energy bodies and assist you to create harmony and oneness as you unify the light and the darkness. This oneness will permeate your consciousness aligning all parts of you in one unified field of harmony and grace. The Path of the One Heart is the next step, not only for lightworkers but also for humanity. We are all being asked to unify our fields of energy and bring all into Oneness, connecting all that we are and anchoring all that we have come to be over so many lifetimes. It asks us to co-create with all that we are in unity so we may indeed co-create with all beings without separation. For the past 15 years Ishtar has dedicated her life in loving service to sharing the work of a council of 33 Ascended Masters. This has been a most profound and amazing journey. Nearly seven years ago the Ascended Masters asked her to find a suitable home for the Ashram of the One Heart, which would be dedicated to their work. She found that place five years ago and the Masters asked her to call it the Ashram of the One Heart. In this Ashram we have created a dedicated altar and manifested a very large portal of light for the Ascended Master work to anchor and ground on the Earth. All the work we have shared over these years has been blessed and passed through this portal out to the world. Ishtar is now being asked to work with a council of Christed Essene Masters to anchor the Unified Field of Oneness for lightworkers, bringing all home to the light. PLEASE NOTE: The word Christed means God Awakened. While the religious prophet Jeshua the Nazarene has been named Jesus Christ, the word Christed does not refer to Christian religion and dogma. How will this school be run? Observance – to choose to observe consciously in each now moment the Divine Light of Source that is held in all creations on the Earth. Surrender – to choose to let go all beliefs, attachments and expectations that hold you in separation to the Divine Truth that you are a Divine child of God in each and every moment. My soul is calling me... How do I sign up?